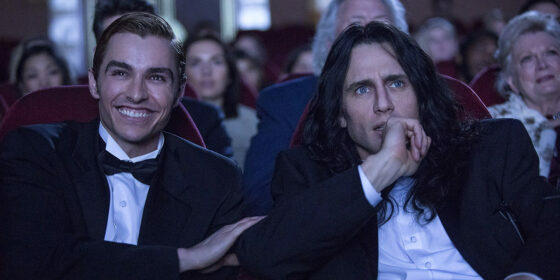 The pivotal moment in The Disaster Artist—James Franco’s absorbing, hall-of-mirrors adaptation of Greg Sestero’s combination memoir/tell-all about his participation in the making of The Room, which some have called the worst movie ever made—comes when oddball-narcissist-auteur-polymath Tommy Wiseau (played, naturally, by oddball-narcissist-auteur-polymath Franco) is humiliated at a Hollywood restaurant by a powerful producer played by powerful producer Judd Apatow: watching Franco, in full Eurotrash drag, be definitively rejected by the man who in reality made his career by casting him in Freaks and Geeks is headily self-reflexive stuff. Even when it’s about losers, history is written by the winners, but the potential unseemliness of Franco and all his funny brothers in arms ganging up—and the gang is all here, from literal brother Dave to artistic sibling Seth Rogen to satellite players Nathan Fielder, Jason Mantzoukas, and a truly priceless Zac Efron—to mythologize the woebegone Wiseau is offset by the fact of Tommy’s Pyrrhic victory. As the closing titles suggest, The Room has made its creator an icon of sorts, as well as a wealth(ier) man, so who’s to say he can’t take a joke—especially one that calculatedly sanitizes its source material (in a way not so different from Tim Burton’s Ed Wood )? Everything here depicting the making of Wiseau’s magnum opus is detailed and hilarious, and the Apatowian plot mechanics and underlying bromantic themes—which essentially boil down to “I love you, man”—don’t do any real harm. For this viewer, the big question coming out the theatre is not whether or not James Franco truly understands or empathizes with Tommy Wiseau’s need to be liked on his own bizarre terms (my guess is yes), but rather if he’s seen Beau Travail—why else would he use “Rhythm of the Night” over the end credits?